For many, the 50th birthday milestone is usually celebrated with friends and family. In modern America, it's a time for re-evaluating choices as young children grow and will soon be leaving home, if they haven't already. Whereas in the past the 50th birthday marked being only a decade away from retirement, the modern 50th is often marking the approximate halfway point in life. In the early part of the 20th century, the average life expectancy for most men and women was 50 years. Fiftieth birthdays were even more major events than they are now. Throughout the 20th century, improvements in quality of life, nutrition and medicine extended life expectancy. Whereas life seemed to wind down or end at age 50, for many modern Americans 50 is a time for a new lease on life and life begins again. The importance of the 50th birthday has not diminished due to changing life expectancy. With longevity come new leases on life and new reasons to celebrate. While some families may tease relatives on their 50th birthdays of being "over the hill" or "ready for retirement," there are many different types of gifts and ways to celebrate the occasion (see Resources). A 50th birthday is a good time for speeches from family members and the person of the hour (see Resources). It can be hard coming up with the right words, but a 50th birthday speech should incorporate acknowledgement of accomplishments, fond memories and goals that remain desirable. Parties should include friends and family. The level of pomp and circumstance should be restricted to the comfort level of the person celebrating the birthday. Too often, people want to blow off their birthday celebrations because they don't want others to make a fuss, or they don't want to be reminded of their age. It is important for friends and family to acknowledge these basic needs and desires, while at the same time honoring a 50th birthday. The importance of milestones diminishes as children age to adults and responsibilities begin to outweigh simple accomplishment. The act of accomplishing 50 years of life should not be taken for granted. Whether the birthday celebration is simple or elaborate, the point is to celebrate how important the birthday celebrant is to those present. 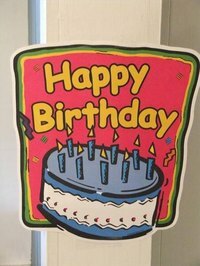 Plan any birthday gifts carefully (see gift ideas in Resources), and avoid gag gifts if they are not appealing to the recipient. Sometimes it's the simplest gifts that are appreciated. It's also considered in bad taste to throw a black-bannered, black-balloon, doom and gloom party celebrating one foot into the grave unless this black humor is to the taste of the recipient. In most cases, it's better to keep teasing gifts to lighter gestures. What Colors Are Used for a 50th Birthday Party? What Is the Point of a Quinceanera?